The French Macaroon. Bar none, its the world’s most famous cookie. 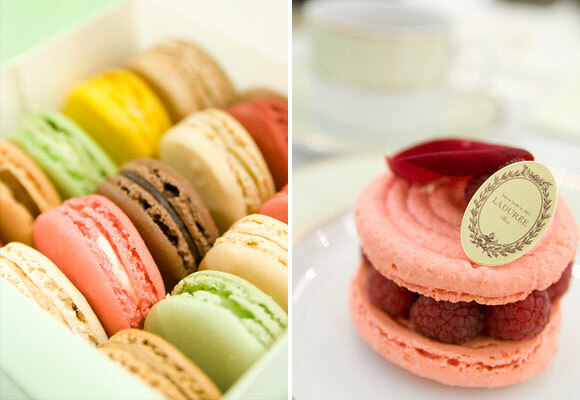 At the very otp of the luxury list of French d…the “La Duree” Macaroon…its delightful… a little luxury and a bit green. Sometimes we just have to indulge and just give in to it. Made with entirely natural ingredients for generations who like us, can’t get enough of the little elegant treats….they come in a variety of flavors but we have always been partial to the green ones… can you blame us? It’s that light and fluffy pistachio creme…sandwiched in between the crunchy yet soft cookie wafer that just holds it together into a creamy and crunchy treat. The color is a soft French green, “Pistache” which has always been one of my favorite colors next to…of course, “French Blue” which is also high on the list of French Classics. Now…newly arrived in New York City….delicious and delightful…so just in case you can’t get to Paris…You can line up outside the door….and wait your turn to experience this French Classic. Or, you can also go to their website…its at http://www.laduree.fr and get into the whimsical online parade of images and sounds that creates the world of LA DUREE and the wonderful French tradition of delicious desserts. Oh….Delight! The little green pistachio macaroons are our favorite…..of course!